Traveling for business? Using unsecured Wi-Fi at the airport or hotel could put your business and personal data at risk. John Smith works for a small business with ten employees. The company is sending John abroad to meet with potential investors. Being the productive employee that John is, he connects to the public Wi-Fi provided by the airport to do some work. He visits the investors’ websites and sends a few emails to his colleagues. On the flight, John continues to surf the web using the in-flight Wi-Fi. Once John lands he goes to a café before his first meeting. At the café he connects to the Wi-Fi to download a revised version of his presentation. After his meetings, John goes to his hotel for the night. There, John connects to the hotel’s Wi-Fi to send his boss a summary of the meetings and to catch up on some news from home. To John’s disappointment, local news videos are blocked due to geographic restrictions. This sequence of events is typical for traveling business professionals. Connecting to public Wi-Fi frequently while on the go may be a great way to get work done, but it can be dangerous if employees don’t use a VPN (Virtual Private Network) connection. During John’s journey he connects to four different hotspots. John works for a small business, so they do not have an IT administrator who set up a secure VPN for John to use. John therefore transferred valuable information, entered log in credentials, and browsed websites that reveal his business’ intentions without any protection. Anyone could observe which websites John visited, read messages he sent, and access files he transferred via unsecured sites with tools readily available online. Unless you are visiting sites beginning with HTTPS, your communication is unencrypted. This means all your communication is out in the open for anyone to see, including log in credentials. Sharing information, such as files, via file transfer protocol (FTP) while connected to public Wi-Fi is also never a good idea. Like visiting non-HTTPS sites, files and data transferred via FTP are up for grabs. 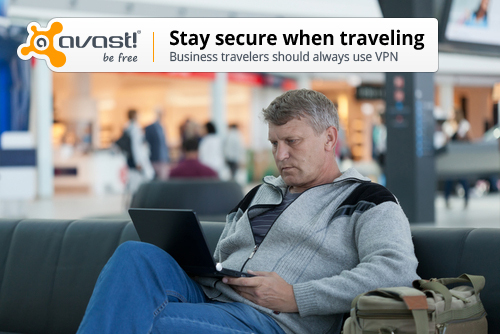 Small businesses, without a VPN network, should turn to VPN services, like Avast SecureLine VPN to protect their data. A VPN creates a virtual shield and tunnels traffic to a proxy server. The proxy server protects business data, thus preventing hackers from accessing files and other sensitive information stored on the device. VPNs also anonymize location; an added plus for when business professionals who need access to content from home that may be blocked while traveling. Hide your login details from snoops on public Wi-Fi. Avast encrypts all of your web use, including log ins and passwords. Avast SecureLine VPN is available in packages of three, five or ten licenses and can be purchased from authorized Avast resellers. Avast SecureLine VPN can also be purchased directly from the Avast online shop.